This is our impression of the drysuits we regularly encounter in South Africa. All but 1 (Stingray Marine) are suits imported into SA. We receive quite a few queries and comments about these reviews from divers outside of SA most of whom find the info accurate and sometimes a little unsettling. That’s because we don’t sugar-coat or avoid mentioning the bad stuff – of which there is plenty. Unfortunately there are so many drysuit manufacturers world-wide that we simply can’t review all the suits and must focus on those found locally. Please e-mail Grant if you would like our opinion on a suit not reviewed here. Also please see the notes about these reviews at the bottom of the page. ScubaPro suits are imported and distributed by Scuba Equipment Africa and are available in dive shops that stock the ScubaPro range of dive gear. They bring in batches of suits so occasionally have stock but most suits are imported to fill specific orders. 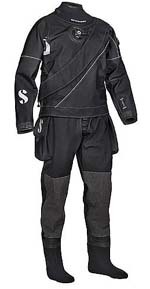 ScubaPro EverDry 4 (Neoprene) approx. R16 500 (incl VAT) Available in mens and ladies standard sizes with no customisation. 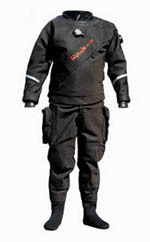 This is a very popular entry level drysuit in South Africa so we have lots of experience repairing them! It’s made with uncompressed 4mm neoprene (ScubaPro say it is compressed but it really isn’t) which is soft and stretchy, with neoprene seals and neoprene socks. The seals on earlier ones were not taped as neoprene seals should be and plenty leak and need to be taped. By it’s nature it’s comfortable and easy to swim with but with those leaky neoprene seals and leaks from punctures and tears it’s a bit like a semi-dry wetsuit. The main problem with these suits is that they are just not going to last nearly as long as you would expect. The uncompressed neoprene punctures, tears and wears easily and the seals stretch and need to be taken in to remain watertight. 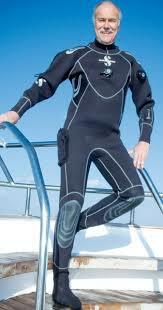 Still, if you only dive occasionally and you require comfort over durability then perhaps it’s the suit for you. ScubaPro EverTec LT (Shell) approx. R29 000 (incl VAT) Available in mens standard sizes only with all latex seals and a diagonal front-entry zip. 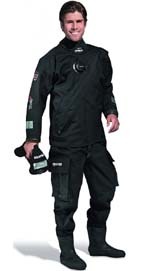 This is another very popular drysuit that we have lots of experience with. The ScubaPro sales pitch will have you believe that it’s a top of the line suit perfect for technical divers and very durable. We think not. There is nothing wrong with the basic fabric and it certainly looks the part but there are some manufacturing and design issues to watch out for: Since it’s introduction in about 2012 (it succeeded the Fjord and Fjord HD – great suits) it has had it seams sealed with a black sealant that has proved very problematic. The sealant cracks after just a year or 2 and endless seam leaks result. We have re-tapped the seams of several EverTecs with rubber tape but that’s a heck of a job and very difficult to remove the black sealant and to get the new tape to adhere well to the glossy surface of the inside of the suit fabric. Only in mid 2015 did we start to see suits without that sealant and the seams are now sealed with machine applied fabric tape. This tape we know from other suit brands and although it’s much better than the black sealant it still isn’t up to the standard of proper rubber tape. Another less serious but quite irritating manufacturing problem is that they have never managed to adhere the valve ports to the suit properly and every single used EverTec we have seen has flapping valve ports. The EverTec is a “telescopic” torso design with neoprene boots which require over-boots. The thing with telescopic designs is they can get various lengths of diver to fit into their standard sizes. That seems like a good idea but we find if you are on the tall side of the range of lengths for that suit size then the arms are invariably too short for you. Similar thing with the boots – more feet sizes fit into the flexible neoprene boots but those boots are not durable or particularly comfortable. They have quite narrow arms and legs so are not suitable for use with bulky undergarments or for “wide” divers. Despite these issues plenty of divers are happy with their EverTecs and although we would not recommend them for technical divers or harsh conditions they make for reasonable entry level shell drysuits. Scubapro Extender R25 000 Similar to the EverTec LT but with proper boots and also available in ladies sizes. We haven’t seen these but will write a review as soon as we get to know them. Scubapro Exodry R15 000 Similar to the EverDry 4 but with latex seals and proper boots. We haven’t seen these but will write a review as soon as we get to know them. 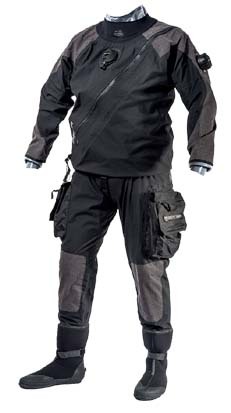 Aqualung (previously Whites and then also Apeks) and Typhoon suits are imported and distributed by Manex Marine and are available in dive shops that stock the Aqualung range of dive gear. Aqualung/Whites Fusion (Shell) R34 000 for the Bullet version. The Fusion appeared in SA in about 2013 when Whites became part of the Aqualung group. It’s a strange design that features a waterproof inner layer and a Spandex or thin neoprene outer cover available locally in 3 variants (standard, tech and bullet) to protect the inner layer. The layers are held together with velcro. We really don’t like these suits. The inside part is akin to a plastic bag and the outside is like an all-over rash vest! The design makes no sense to us. I’m sure proper tech divers would run like hell to avoid being seen in the “tech” spandex variant. Durability – none. The 1st few minutes of your 1st dive with it will be dry, but then you will sweat yourself wet in the plastic and puncture or tear it and never be dry again. One good thing about the Fusion is that factory fitted Si Tech (they call them SLT) rings for silicon seals are optional in place of latex seals. Although in SA the option may not be available depending on what is in stock. How’s that price!! Madness. Apeks Fusion KVR1 (2 layer shell) In 2017 we saw The Whites/Aqualung Fusion suits being re-branded as the Apeks KVR1. They seem to have dropped the 3 variants of the outer skin layer idea and now have only 1 skin which is a definite upgrade to the previous Bullet skin and is much tougher and heavier. We haven’t had any KVR1’s in for repairs yet but it seems it is basically the same concept as the Fusion and I don’t think I will ever warm to the double layer with plastic on the inside design. Apeks has a good name and I wonder why the Aqualung group couldn’t produce a better drysuit to go with the Apeks name. Typhoon ProSport (Shell)(Not available as new suits anymore but still quite a few out there in the used market) This is another suit with which we have had a lot of experience as they have been available since about 2004 when they replaced the Ranger Sport model. For an entry-level suit it’s well made and has a standard shoulder zip, good quality valves and proper boots fitted. They have proven to be quite durable but they do have a few issues; Firstly, they have a bad reputation for being leaky. They suffer from continuous seam leaks which is surprising since the seams are properly sealed with wide rubber tape. Secondly, their design features very wide arms and legs. That may have been to accommodate bulky Thinsulate undergarments (also offered by Typhoon) but it was slightly overdone and they are quite baggy on most divers. Typhoon CNK Tech (Shell)(Not available as new suits anymore but still quite a few out there in the used market) This suit was marketed as ideal for technical divers but in reality it is just a ProSport in black with a front-entry bib system. They suffer from the same leakiness that afflicts the ProSport, perhaps more so as the bib increases the number of seams sealing up difficult to get to areas. We don’t really like the bib system (it is unique to this suit) as replacing the zip when it fails is a nightmare job. Typhoon ditched the design in favor of a conventional diagonal front zip in their new front entry suit. Typhoon Discovery This is their entry level shell suit with a shoulder zip and latex seals. Typhoon Seamaster (mens) & Seamist (ladies) These are their neoprene entry level suits. Typhoon Evolution This is their shell suit front-entry option. Typhoon Fathom This is their top-end delux shell suit. We can’t see much difference between it and the Discovery though. We don’t have much experience with the new Typhoon range of suits. To be honest the shell suits seem to be much the same as the old ProSport with the same tri-laminate fabric and wide arms and legs and most likely the same leaky nature. The Seamaster/Seamist seem much the same as they have always been, not bad really, but quite basic. We haven’t seen the Quantum yet. Mares suits are imported and distributed by Aqua Divers SA and are available in dive shops that stock the Mares range of dive gear. Mares TechFit (Shell) R22 249 in 2016 but replaced by the XR in 2017. They were available in mens standard sizes with no customisation.We quite like these suits and have had a fair number in for replacement of their latex seals with silicon seals. The suit fabric looks very plastic and cheap on the inside but it is laminated to a decent Cordura outer layer so overall construction is durable enough and extremely watertight. I wish they came from the factory with silicon seal rings as the standard duty latex seals that they come with won’t last long. Also, with that plastic inner layer you will definitely need an undergarment with good moisture wick capability to avoid getting wet with perspiration. We consider them to be quite expensive but reasonable quality. Mares ProFit (Neoprene) R16 999 in 2016. Available in mens standard sizes with no customisation. We unfortunately haven’t had any of these in for repairs so we can’t review them yet. 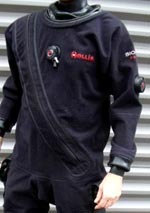 Mike’s Dive Shop in Port Elizabeth are the importers and distributors of Hollis and Oceanic drysuits in SA. Mike doesn’t actually hold many suits in stock but when he does order suits (Hollis from the US and Oceanic from the UK) he will add a few suits to the order or add suits to orders of other gear so there are quite often Hollis (less so with Oceanic) suits available. Fortunately they have their shipping and customs clearance worked out so even if they don’t have your size in stock you could have your suit within a month. Hollis BioDryFX 100 (Shell) This is a light-weight drysuit marketed as being comfortable and durable. The comfort part we can certainly endorse as the suit fabric (BioFlex with WearForce) is very flexible . The durability part, not so much. The fabric tends to fluff on the outside and the inside is very plasticky so perspiration will keep it damp. Unfortunately they are fitted with latex neck and cuff seals from the factory but discerning owners can have us fit rings for silicon seals. I’m not sure if we will see many more of them as the DX-300 may have replaced it. Hollis DX-300X (Shell) approx. R35 000. This is the latest offering from Hollis and a true top-end suit. Nice durable fabric, standard with rings for silicon seals, plastic YKK zip and neoprene socks which are reportedly quite comfortable. All good so far (despite the high price) but we have seen 3 in our workshop and all 3 had seams that had failed beyond repair after about 50 dives. The 3 were returned to Hollis for warranty replacement but we believe there is a technical issue with the seams and even the replacement suits are now failing. Hollis BTR-500 (shell) Price unknown. We haven’t come across any of these yet but it appears to be the current light-weight offering from Hollis. Oceanic Flexdura (Shell) Ah you’re my favorite! Such a pity these are hardly ever kept in stock. They feature a very nice somewhat flexible fabric and decent components. Latex seals only – sorry, but we could change that. 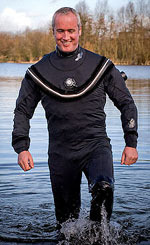 A superb mid-range drysuit. Oceanic Aerdura (Shell) No you’re my favorite! A really durable, well made drysuit. Top-of-line quality but once again hardly ever available locally. Also only available with latex seals but easily converted to silicon. A brilliant suit for serious tech divers. There are quite a few DUI (from San Diego in the US) suits in South Africa which is a bit strange as they have never been actively marketed here and are quite expensive. Komati Springs Diving (Don Shirley) are listed as the South African DUI agents but they unfortunately don’t keep stock of DUI suits and would need to specially order 1 for you if you were prepared to spend big. DUI led the way with drysuits that fitted in with whole DIR (doing it right) approach to diving which made them the suit of choice for technical divers and cave divers in the early days. They have a good reputation for quality and comfort and have been copied by many manufactures trying to get in on the tech drysuit market. Black Pearl, Frog and SANTI shell suits started off as being close copies of the DUI TLS range and then evolved with the use of different fabrics and updated designs. We really like the DUI Zip seal system as the suit rings are way more flexible than the Si Tech suit rings and they can accommodate silicon seals. So we tried to become an agent for the seals and rings so that we could offer them to our clients as an alternative to Si Tech products but DUI refused to allow us to import and install their rings. They said it was because they feared we wouldn’t fit the rings correctly which would reflect badly on DUI but I suspect they just want to keep their rings and seals away from other manufactures and keep them proprietary – fair enough. We encounter the TLS models most frequently. They are light-weight, a little too light-weight for our liking, but very comfortable and good looking suits. The suit fabrics used won’t last as long as you might expect but at least the seams are well sealed with an Aquaseal like sealant. The zip seals and zip dry gloves that go with these suits are great but you will need to keep your own spares as nobody keeps stock of them in SA. On the negative side are the ridiculous “turbo soles” boots which wear our quickly and their valves are sealed to the suits with sealant as valve ports are not used. The CF range are their neoprene suits. Well they are not like other neoprene drysuits as they have developed a process of hyper-compressing neoprene from 3mm down to 1mm. The resultant fabric is more akin to a shell suit than a neoprene suit but it maintains some flexibility while being highly durable. We love that fabric. Unfortunately the boots and port-less vales are problematic but we can sort those out for you. Reviews being written – check back soon. Forth Element in the UK are well know for their top quality and high-performace thermal undergarments but they also produce drysuits. Pisces Divers are the agents and importers for Forth Element in SA. They keep stock of the range of undergarments but unfortunately no drysuits as all the Forth Element suits they sell are made to order with their unique 3-D body scan system. It should take 4 weeks from order to delivery. Argonaut 2.0 Hybrid (Shell) R27 000 We really like the Argonaut and wish there were more in SA. It ticks all the boxes and exudes quality with a no frills and flashy bling . Our only concern is the stated “breathability” of the kevlar fabric as we have had bad experiences with breathable fabrics degrading over time and becoming porous. It’s also exceptionally light-weight and may not be a rugged as one might expect from a kevlar fabric. Their undergarments are the Arctic at R4 950, the Xerotherm at R3 850 and the unbelievably warm Halo 3D at R7 650. 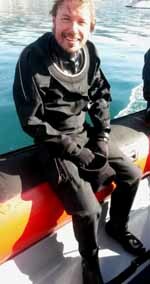 Stingra y Marine (Shell) Stingray drysuits are the only drysuits made in South Africa. The Stingray factory (they also make boats and bakkie canopies) is in Kraaifontein Industria, Cape Town. The boss there is Mike and he has lots of drysuit experience. They have been making them for over 20 years and there are hundreds of them in service all over SA. We get plenty in for repairs so we know them very well. Standard sizes can be made but they are only made to order so you might as well get a custom fit suit. From measurement (which could be done by e-mail but is best done in person at the factory) to delivery takes about 4 weeks. Don’t try and buy one through a dive shop as Stingray prefer to deal directly with divers especially where suit measurements are concerned. It’s a very basic, well made suit with proper traditional tri-laminate fabric that will outlast most divers. The zip and valves are fine and the standard latex seals are OK. But there are a few issues; For some reason they have never had nice boots fitted and the standard boot that comes with these suits is a cheap plastic gumboot. I think Stingray made a hundreds of these suits for police divers who didn’t mind the gumboots or didn’t know better so that’s how they developed. Proper drysuit boots are also very expensive to import. And then there’s the hard plastic tape used to seal the seams where rubber tape would be much better and would not cause wear points at the edges of the hard tape. That said there is a lot going for this suit and we may be able to turn this beast into a beauty. It’s been done before. Here’s how; Negotiate with Mike to build you a custom fit one but leave off the gumboots and the latex seals. I reckon you could get about R2 000 off the normal price. Then bring it to us for Si Tech silicon seal rings and our nice new drysuit boots. That will cost about R5 000ish. You end up with a highly durable, custom fit, suit with nice silicon seals, comfy boots and the total spent should be less than R22 000. Quite a good deal! Please note that the prices listed here are a guide only as there are often variations with exchange rate fluctuations and specials. Also note that being in the repair business we naturally focus on suit durability over other aspects. But what constitutes a durable drysuit? If you got 100 dives out of a suit would you be happy? 1 000 dives? It’s hard to define and varies wildly with the conditions it is used and stored in. We think an entry-level drysuit should have a minimum life-span of about 300 dives/3 years while a top-of-the-line suit should last for more than 1 000 dives/10 years. And beware of manufactures with excessive use of meaningless marketing jargon. I have yet to discover any drysuit that was not “Designed for Special Forces” “HD everything” “Tech” “Double Tapped” ” Ultra” “Extreme” “Flexible” …… ja ja blah blah.